I actually went there twice in the past week (a rarity these days of going out at all, never mind the same place). Once with my friend Rachel and once with my aunt and uncle so I’ll have pictures form both days. First I’ll say they did a nice job with the remodeling. It’s pretty much the same layout but have added more food cases and a sit-down counter. The chips are light and crispy and they spread is lightly seasoned. It’s easy to snack on these until they’re gone. When I went with Rachel we got a sample plate and some potato knishes. 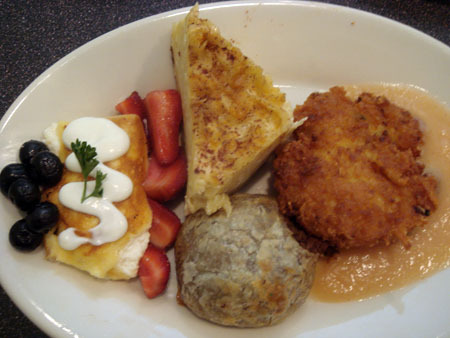 The sampler had a meat knish, slice of kugel, potato latke and cheese blintz. 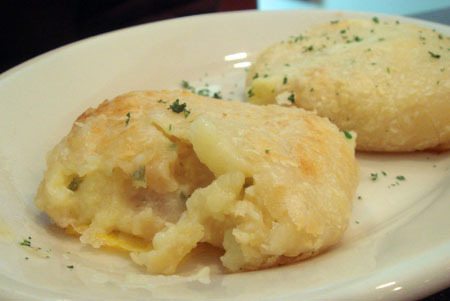 I was a huge fan of Joan and Ed’s meat knishes and while everyone does knishes a little different, I always find myself comparing them to J&E’s (and my own). 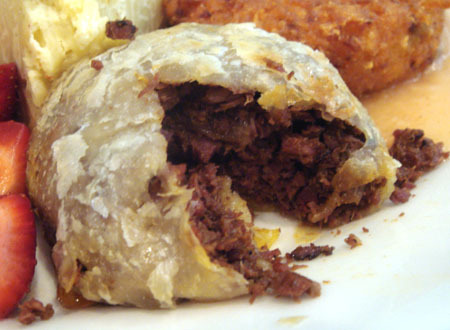 The knish was pretty good, I thought the dough was great and the filling was pretty good but a teeny bit dry (compared to…) but flavorful and enjoyable. Everything else on the plate was good, not amazing but not disappointing either. They both thought it was great and complimented the potato salad too. I decided to get challah toast instead of a bagel and chose a combo plate that offers your choice of three fish from their list of 8. I got nova, belly lox and a scoop of whitefish salad. Everything was so good. 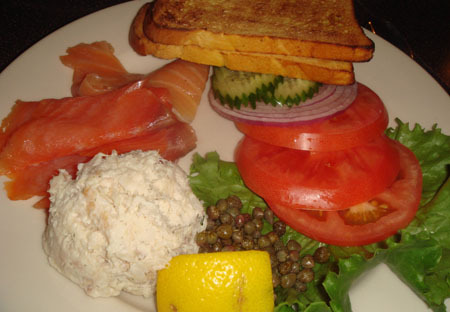 I love whitefish salad and they did a great job with it, not too salty and not too much mayo. I forgot to mention we also got some matzo ball soup, which again was great and the matzo ball is nice and soft like a matzo cloud! I think Zaftig’s is a welcome addition to metrowest. It’s not cheap, and I know the place has got mixed reviews because of that being worth the food but I think it’s easy to go anywhere else and pay as much for lesser quality food. We liked it and while I won’t be there all the time, I’d consider it a treat to go back and would love to try breakfast items like chocolate brioche french toast. Everything on the breakfast end looked delicious. Also the service might be hit or miss. Rachel and I had a rude waitress who didn’t seem to care about her tables but last night we had a polite and courteous waiter. Both times it was not very busy and as someone who has waited tables since I was 19, there is just no excuse for being rude. Regardless of the possible service issue (maybe that girl won’t last long), I’m looking forward to someday going back. I got a sandwich there the other day and it was so good !! And so big I couldn’t finish it !! 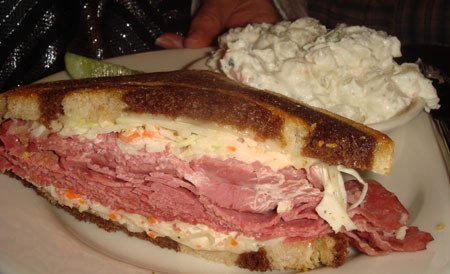 It has so much corn beef, the sandwich was so thick and impressive ! I’m def going back! Its a bit pricey but worth it. when we lived in Allston (an eternity ago!) we would go to the one in Brookline for brunch a lot…so so yummy. Got a pastrami sandwhich with a side of potato salad and diet coke can – $16.12. Sandwhich was pretty good, but J&E was better. Potato salad was solid. But for that price, seemed a bit outrageous. Hard to be a regular there at that price. I went here with 2 friends and we each got a sandwich and a cupcake and the bill came to $55.00 WITHOUT TIP! This place is way to pricey for what you get. The food was okay and the service was decent considering it was Tuesday night. They told me it has been kind of slow and they may cut back on the hours soon. I won’t be returning at thiese prices. I can afford to drive to any other Jewish deli within 20 miles and get a better overall meal that wouldn’t cost this much. J&E are not walking through that door!! Been there 3 times. Personally, the sandwiches look great, are huge and are expensive. I dont eat like that any more. My visits have had smaller items that fill me just the same and are less. I had the appetizer sampler as a meal. That comes with kinish, kuegel, and blinz. i had the stuffed french toast, also great. 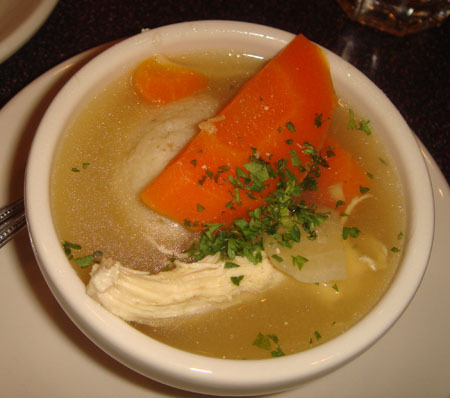 chicken soup with mazah ball is excellent. 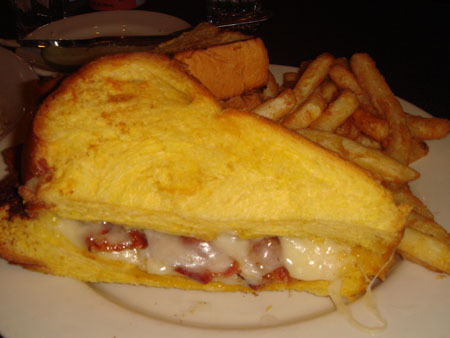 For less $ and you can order half sandwiches Kuegels Deli in Trolley Squire is great. 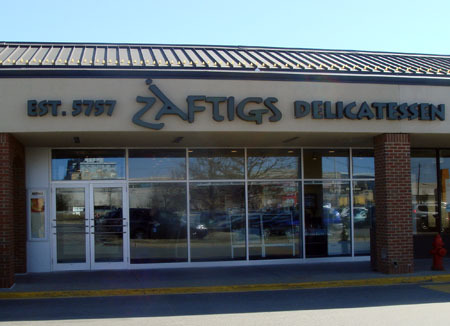 Went to Zaftigs and was looking forward to a great deli fix and was less than impressed. the first thing you see is this garish portrait of an obese woman in a big red dress when you walk in. Yikes! This portrait does not set up an apetite and is scary. Hostesses were fabulous, friendly and very hospitable. Food was just okay. Got the meatloaf and asked for “no gravy” . Meatloaf came with gravy and he ost od awful steamed vegetables. The carrots tasted just like the broccoli which tasted like the cauliflower which tasted like the carrot. Hey they had no taste!. Gravy was like cafeteria grade school gravy. Got a cupake for dessert with coffee. I think it was made ahile ago as it was stale as well as the chalky buttercream EEk!on top. My girlfriends food was alrightthough. I wil l give them anothet try after i work a few more shifts to pay for the bill. What is Zaftigs translate to in yiddish? I know. It translates to WE GOTCHA! They will make/sell half sandwiches. Went there for breakfast (I was craving potato pancakes) and we waited ten minutes and were served. the prices were the first thing that caught my eyes. Potato pancakes were ordered and my wife had the Eggs Benedict. Well, the wait was customary but the noise level was quiet loud. Going on a holiday I was expecting an influx of people and it showed. 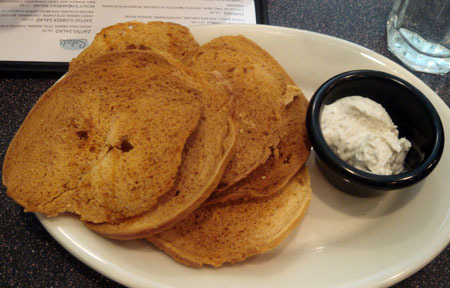 When the food did arrive I have to say the potato pancakes were not what I thought. My wife thought the eggs were okay, the side of home fries were very bland and had no taste. We got our check and my eyes were shocked that the total we paid. Not going to visit anytime soon; the price and the above reviews make me wonder if we can make homemade potato pancakes and benedict. ate there when it first opned and we spoke to the owner about how awful the potato salad was and he went and got us a new dish,he hovered over us to see what we thought and we said it is ok,it wasn’t. needless to say we paid our hefty bill and will NEVER go there again. joan and ed were favorites of our even as far back as when they were in shopper’s world. and you left there with a smile and always a great meal.